Frizbit supports Push Notifications also for Mozilla Firefox! Firefox is the second most used browser in the world on desktops with %12 marketshare . Then why lose customers on Firefox? iOS devices can’t receive Firefox push notifications as well as from other browsers. Firefox push notifications are easy to use and doesn’t have a remarkable change between operating systems. You don’t have to send the same notification to everyone. 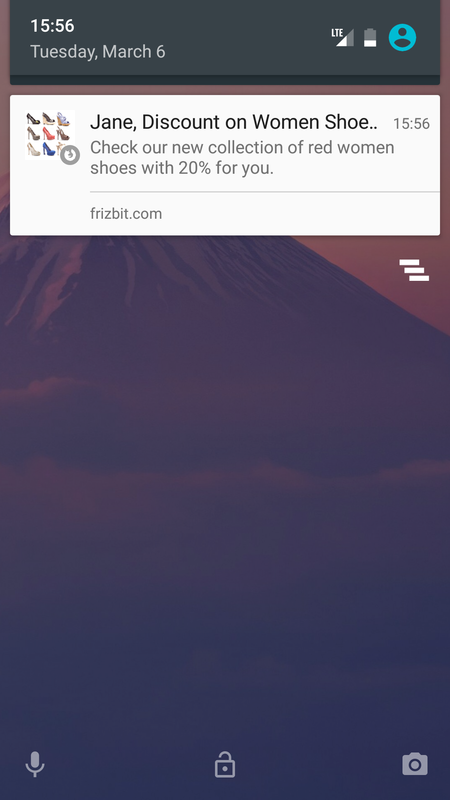 Personalize your Firefox push notifications with Frizbit; optimize them according to visitors’ interests. Send notifications how they like it, using their name. You can send notify box to visitors with your brief sentence about why they should allow your Firefox push notifications. This pop-up will increase the allowance rate on native op-in box. Schedule your Firefox push notifications. Send them notifications on specific days or within specific time periods. How to use Firefox push notifications? If they click ”Not Now”, you can ask again another time but they can also click “∨” and choose to never allow notifications. Create your notification sentence and add an image. They will see the Firefox logo on the left side of the notification. You can also create personalized notifications and use dynamic fields with Frizbit. Dynamic fields are the improved version of personalized notifications. If they click ”Close”, you can still send notifications but if they click “…” they can choose to disable notifications. Send Firefox push notifications any time you want. You can decide for a specific time period. You can also check how push notifications affect your visitor metrics on Frizbit’s dashboard.